(Reuters) – At least 73 people have been killed across Pakistan after heavy rains brought flash floods and caused homes to collapse in the Punjab and Kashmir regions, government officials said Friday. Most deaths occurred in the city of Lahore, Prime Minister Nawaz Sharif’s powerbase, further damaging the government’s standing after weeks of protests aimed at forcing the premier to step down. As the political crisis dragged through its third week, people’s attention turned to the devastation brought by the floods, with television channels showing live images of villages and towns inundated by muddy water. At least 43 people have been killed in Punjab province and 30 in the Himalayan region of Kashmir in recent days, officials said. Authorities have issued flood warnings across the country. 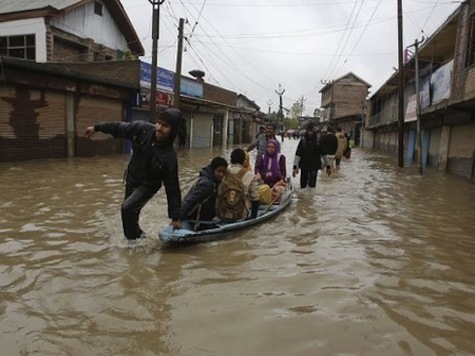 “We are bracing for more deaths as more rains are expected,” said Khawaja Omer Rashid, a spokesman at Kashmir’s disaster management authority. In the Indian part of the disputed Kashmir region, at least 65 people were killed after heavy rain triggered flash floods, officials there said on Thursday.